A family to heal him? After a rocky beginning, midwife Bonnie Reid is surprised when Head Obstetrician Jacob Layton offers her, and her little daughter Freya, a place to stay! Bonnie's looking for a fresh start, but she didn't expect it to be with brooding - and totally gorgeous - Jacob... Family life has never been an option for Jacob, especially after his recent cancer diagnosis. Yet the Christmas magic Bonnie and Freya bring into his home makes Jacob feel more alive than ever! It might be temporary, but can Jacob really let Bonnie go? 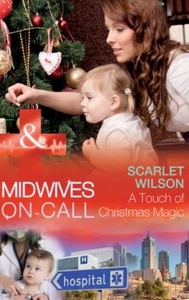 Midwives On-Call at Christmas Mothers, midwives and mistletoe-lives changing for ever at Christmas!